It has been a long time since I felt I had a new discovery or that I had beaten to the scene the other online and offline choices you have for your culinary voyeurism. After a long dry spell, I have a scoop. The thrill of the chase is the ultimate reason why most food writers blog. That moment of discovery when you walk through the door and find that you have found something worth writing about and that you get to be that person that opens a door to a new adventure for someone else. So here we go with Moe’s. Moe’s had a few things going against it. It is a BBQ joint. So many in central Ohio have tried but so few have succeeded at doing BBQ well. And by doing it well, I mean doing it right. BBQ joints frequently excite me at the beginning then quickly disappoint me at the end. The next challenge is the space. Moe’s is in a spot in downtown Granville has witnessed several concepts come and go. The one successful concept in the spot occupied by Moe’s was long ago a place called Brew’s Cafe. You may have heard of that place – everyone loves it and fills the place day after day after it moved down the street. Business took me to Granville and one of the bonus’ of owning your own business is being able to pick where you meet and who you dine with. The original plan was to meet at Brew’s but while checking the hours of operation I found that a new BBQ place had just opened down the street. This changed the plan. I hoped for the best but prepared my palette for the mediocre. It is not fair to visit a restaurant open less than 2 weeks and rate what they can or can’t do, but I was ready to give them the benefit of the doubt. I’m happy to report this rookie delivers. The first sign of potential was the sign at the front door – see below. 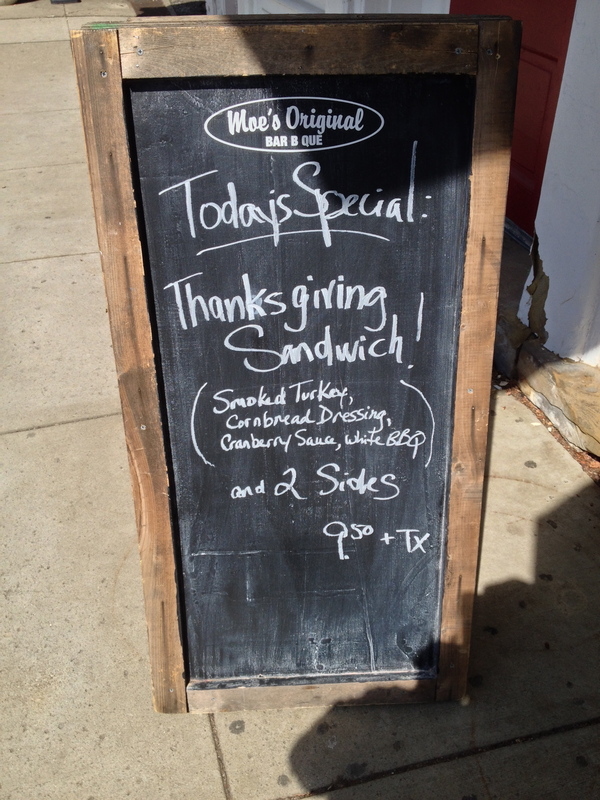 That’s right a Thanksgiving sandwich! Take the best food day of the year and compact it into a sandwich by using a simple bun as a base then adding smoked turkey, cornbread dressing, cranberry sauce and a drizzle of white BBQ sauce. I had to get this….but I was conflicted. 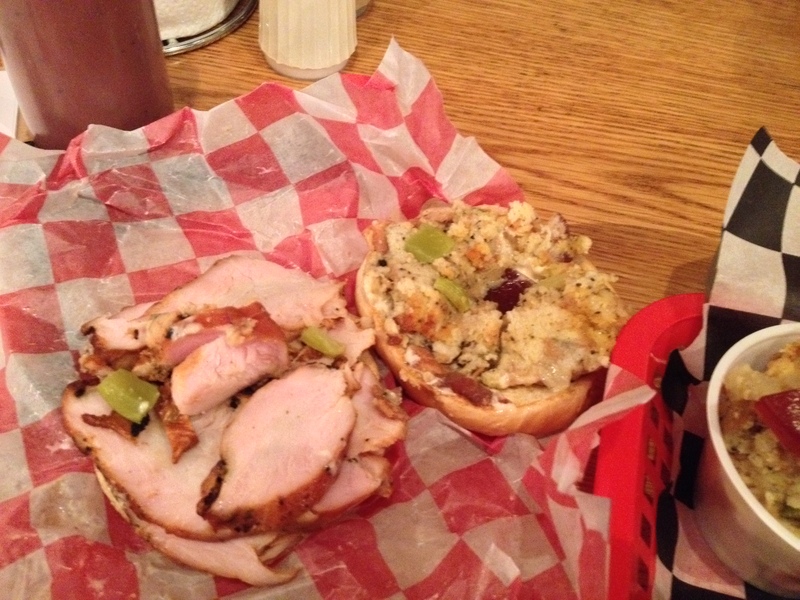 I mean I can’t properly judge a BBQ place by a smoked Turkey Sandwich so I decided to go in-depth into the menu. Fortunately, Moe’s menu is set up to make grazing easy. 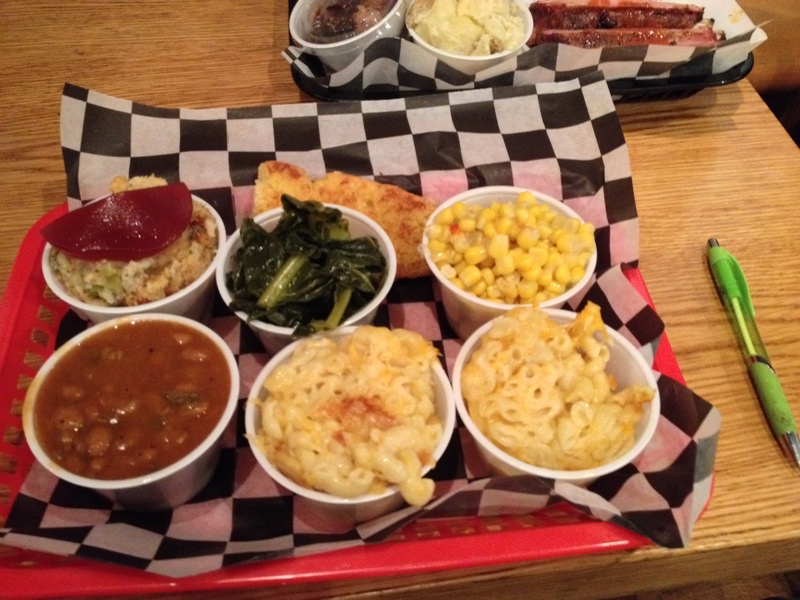 So here is what else I ordered in half pint servings: baked beans, mac’n cheese, marinated cole slaw, potato salad, banana pudding, collard greens, skillet corn (relish) , Mississippi Mud Pie (Pudding), squash casserole, corn bread…..and a side of ribs. Before I go into detail on the above let me share with you why some people consider me the devil. My lunch companion is working with a personal trainer and by ordering the same sandwich as I did – he had already broken all of the rules he with given for the day for calorie consumption. Then I had him help me try the sides. (Then later in the day I took him to wineries and a Moonshine Distillery). Maybe I am the devil, all I know is the devil in the details and Moe’s does the details right. I did offer to write a note to his trainer explaining that his client had no chance by hanging out with me. The place looks and feels like a BBQ joint (or kind of like a BBQ themed Chipotle restaurant). 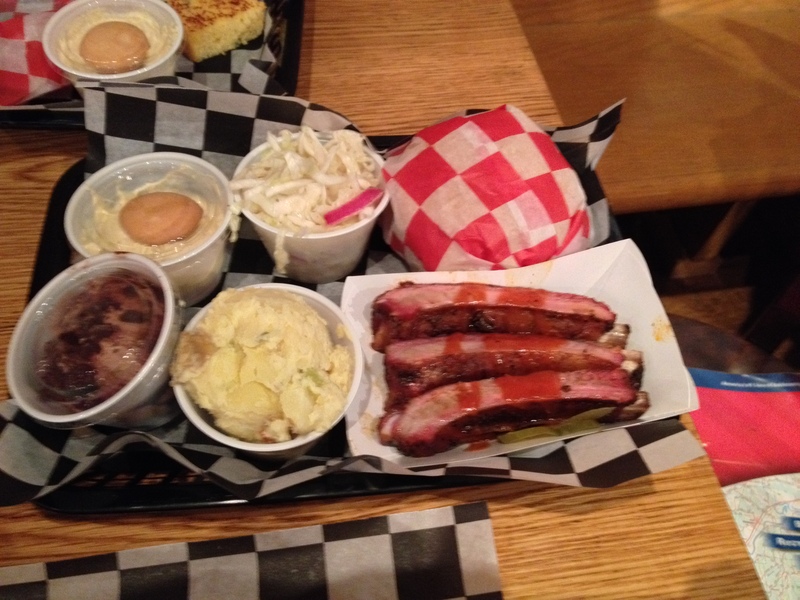 There are rolls of paper towels on each table – all real BBQ places add that touch. The aesthetics are all rural, industrial and music themed. The furniture is sufficiently wooden, etc. Moe’s could be in North Carolina, Texas or ……Alabama. That’s right greenhorns, Alabama. There is an Alabama style of BBQ which I was schooled in several years ago by the Coop Dawg and O’Pa (might sound like a sitcom but they are real people). Moe’s does “Bama BBQ” as intended. Want a sandwich “Bama style”? Here is how you do it add: BBQ Sauce, White Sauce, slaw and pickles. White sauce uses Mayonnaise as the base instead or tomatoes and/or vinegar. The owners go by the name Gallagher and they have bounced around BBQ country a bit but they missed Central Ohio and wanted to come home. The way for them to return was through owning and opening a BBQ restaurant. So taking stock of their different backgrounds the menu reflects their history by mixing several styles. The main dish BBQ entrees are Alabama style. The side dishes are inspired by the kitchens of North Carolina and the ribs are strictly St. Louis style. Regardless of what style you subscribe to the whole of the menu is greater than the sub of the parts, or the sides. So back to the food. The Thanksgiving sandwich was exceptional. The turkey was perfectly smoked – just enough smoke in the meat to add flavor but not enough to dry out the turkey. As for the sides each one reflected the style one would expect at a picnic in North Carolina. My favorites were the Mac ‘n Cheese and the corn relish. Both were properly seasoned and flavored and if going up against other of their ilk they would have come in best of show. The mac in particular, had just enough sear and crunch caressing the cheese to make it just right for me. The slaw was a mix of long shards of cabbage and a sweet yet sour dressing. The banana pudding featured an out of the box vanilla wafer on top in a manner I would describe as old school. The St. Louis style ribs were true to the style, expertly rubbed and with meat that was tender and easy to pull from the bone. The cornbread had a corn muffin quality (which is how I prefer it) and paired perfectly with all of the sides and all of the sauces. And about the sauces – there are several styles and levels of heat and all are made in-house. Also in the house – a great bar on the second floor and plenty of local beer including Buck’s from Newark and Homestead from Heath. There as a lot to like about this new kid on the main block of Granville and I look forward to the Gallagher’s growing their business and refining the menu to meet the meat needs of the community. I think this place is going to be a hit. And I was so glad to find a Bar B Que joint that did not disappoint. This entry was posted on April 21, 2014 at 9:39 PM	and is filed under BBQ, Ohio, restaurants, Road Trip, sandwiches. Tagged: Moe's BBQ, Moe's Original Bar B Que. You can follow any responses to this entry through the RSS 2.0 feed. You can leave a response, or trackback from your own site. I can’t wait to get there. Looking forward to it.